While it’s common to hear retailers and loss prevention executives stress training as a priority, it’s often a weak link in the security chain, according to experts presenting at the recent 2018 GSX security conference in Las Vegas. Insufficient user training is often why security technology fails to deliver anticipated efficiencies, they said. Additionally, companies often decide that the resources necessary to prepare frontline staff how to respond to crime events outstrip the value that such training provides. However, technology gains are simplifying retail security training delivery and making instruction more reflective of the real world, which is helping to change that calculation. Eliciting active participation—which is easier with today’s advanced technology—enhances the effectiveness of training and reduces the need for costly re-training, studies show. CBS News recently highlighted how Walmart, Chipotle, and Verizon are using virtual reality (VR) to prepare store employees for dangerous or difficult situations they could face on the job. Verizon said it plans to send 15,000 of its store workers through a VR training program designed Strivr, a VR training developer, to teach workers what to do and what’s it’s like to experience an armed robbery at store opening, at closing, and in a smash-and-grab event during store hours. Such training can be lifesaving, Michael Mason, CSO at Verizon, told CBS News. “If nothing else, then an employee understands what he or she should be looking at in a bad guy when they’re in [a store] and if that helps identify a bad guy and take him off the street that means they can’t repeat that activity,” he said. Adults, more than children, need learning to relate to their actual activities and require active participation for training to have a lasting impact. Companies that use video or lecture-only training have to re-train more frequently because employees more quickly forget the lessons. According to research by the National Institute for Occupational Safety & Health, workers whose education includes scenario-based instruction score better on retention exams, have a more positive attitude toward training material, and think arguments used in training are more persuasive. 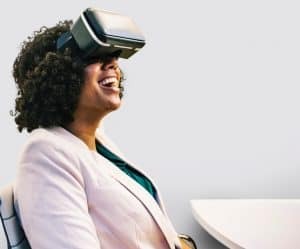 VR training, by immersing employees and LP agents in particular events, is pushing that advantage one step further. But not all online or computer-based training is created equal, warned workplace violence consultant Felix Nater. He has said that some past online training programs have been insufficient and too generic to be truly beneficial, noting that a rudimentary online training program doesn’t provide the same value as in-person training in the actual work environment. It is especially true for physical actions that employees may have to take, like how they should move or take cover in a workplace shooting. If simulated training doesn’t truly duplicate the store experience, then online or software training should be viewed as a useful adjunct to participatory training, rather than as a replacement, Nater suggested. Darrell Clifton, CPP, CSP, executive director of security for Eldorado resorts, warned about the stakes of training at the recent GSX security conference. Without training, individuals who face an unfolding crisis rely on their instincts or, worse, what they’ve seen on television or in movies. It’s why, when hiring security officers, training is foremost in Clifton’s mind. “We hire on the basis of their willingness to learn, not on past experience,” he told peers at the 2018 GSX conference. Crowd management and handling difficult customers, such as those who are intoxicated or disturbed, require special skills, Clifton explained. “At the hiring phase, we look for people who show that they have the social skills you need to deal with people,” noting that his security department’s training focuses on creating a culture of guest service and customer safety, not merely asset protection. To identify new training tools, such as the one Verizon has started to use to protect its retail store staff, retailers need a structured training program that acts as a catalyst to continuous improvement. Training must be more than mere curricula, said experts. Four key questions to ask of any retail security training program were highlighted in a previous takedown of the Transportation Security Administration’s officer training program by the Department of Homeland Security’s Office of Inspector General (OIG). 1. Whose job is it? The TSA was criticized for failing to establish a lead office for organizing and coordinating the officer-training program. Private-sector organizations can make the same mistake by failing to make specific individuals responsible for managing the security officer training effort. Lesson: Clearly identify who in the LP department is responsible for the overall management of the analysis, design, development, and implementation of security training. If training is developed at the corporate level but delivered locally, this individual(s) needs to be specifically tasked with assessing the timeliness and completeness of training delivery. 2. How does training get updated? Training programs need to be periodically reviewed to ensure that content is up to date and reflects the needs of participants, and to assess whether the manner in which training is delivered could be improved through the additional of new industry tools or materials. In the OIG critique, analysts said that failing to develop standardized processes for training programs ultimately leads to training courses going unmodified. Lesson: LP departments need to write specific procedures that describe how it will be determined when or if training courses should be modified. Additionally, changes made to training programs should reflect actual evaluations of agent performance, such as in undercover tests or written test scores, and a rigorous review of available tools and technology for administering training. Without a documented process for updating training based on changes in technology or equipment, companies miss opportunities to enhance officers’ skills and abilities. 3. Are training resources sufficient? The research of TSA training found it failed to provide resources to match the requirements of its online training modules. For example, some officers struggled to complete their online training because a sufficient number of training computers weren’t always available, computer malfunction, bandwidth limitations, long start-up times, and distracting learning environments. Lesson: Ensure that staff and LP officers have the tools and time necessary to complete retail security training requirements. As part of the written training program, denote all resources that will be required to deliver training, such as the appropriate number of training computers, the appropriate environment in which staff should be allowed to learn, and all materials necessary to deliver situational learning exercises. It is especially important, at the corporate level, to ensure that individuals that deliver training at stores are providing staff with the support and resources they need to extract maximum value from their time spent in training. A sufficient number of personnel who are tasked with monitoring and reviewing the mentoring program. A structured training curriculum delivered to the LP officers who will serve as instructors to officers-in-training. Training topics should include mentoring skills and how to provide feedback to trainees. A written program to coordinate the program companywide. It should identify specific requirements of the program such as trainee-instructor ratios, training duration, system for assessing participant satisfaction, how the program performance will be measured, and requirements for reports and reviews.